Director and Principal Architect of DTB. On graduating Chris worked at the University of NSW as a research assistant and tutor in natural lighting design and solar energy research, thus fostering his commitment to environmentally sustainable design. He worked for four years in the United Kingdom in hospitality, commercial, recreational, residential and industrial fields. Chris’ heritage experience is grounded on this early experience at a major redevelopment site on the banks of the river Thames on a project requiring extensive renovation of two National Trust listed Victorian mansions, refurbishment and repurposing of other heritage buildings on the site as well as major site infrastructure and residential housing. On returning to Australia Chris was employed as a project architect by a well-known and established architectural practice specializing in grandstand and sporting projects. Chris worked on numerous such projects including the Sydney Cricket Ground (Bradman Stand), Rosehill Racecourse (Fleming Stand), Canterbury Racecourse (Kennedy Stand), Randwick Racecourse (Paddock & Members Stands). In 1994 Chris was successful in winning, on his own account, a commission to carry out a major redevelopment at Harold Park Paceway, Glebe. In 2013 Chris completed for the Harness Racing Club, a $35M relocation of the Paceway to Menangle including Grandstands, Race Day Stalls, Administration, Retail, Hospitality and Media facilities, and site infrastructure (electrical, gas, water, on-site sewer). In recent years Chris has undertaken over 300 refurbishments & infrastructure projects for the University of Sydney, Australian Catholic University, UTS, University of NSW and Macquarie University. Many of these included the design of a significant number of laboratory refurbishment projects, which expertise has now flowed beyond the University to commercial enterprises. Further details of Chris’ career are available on the separate CV page. 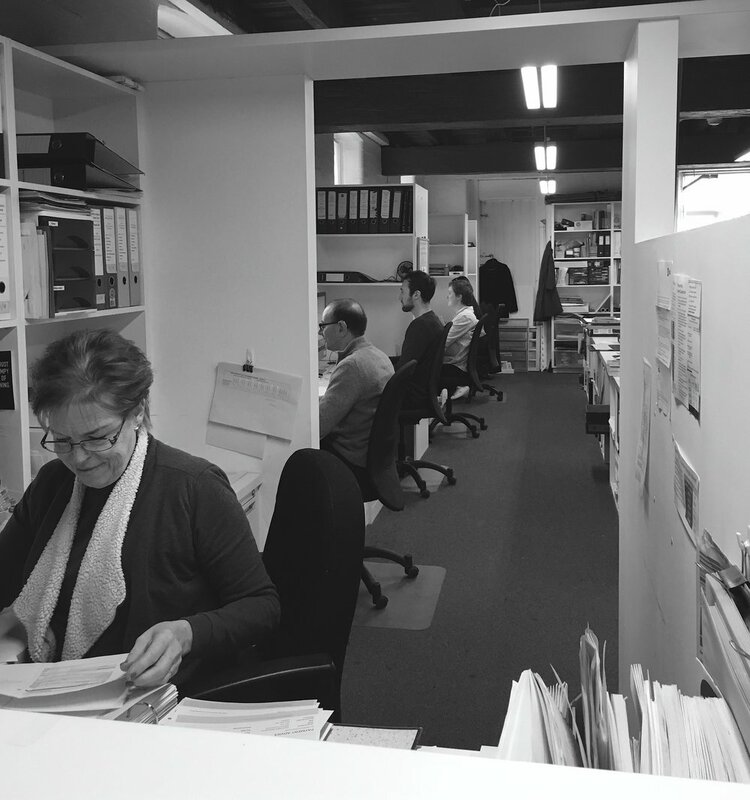 Helga joined DTB in 2003 after working for many years with well-known and established architectural practices in Sydney and London. Her work in Sydney in the 10-15 years prior to joining DTB encompassed infrastructure (rail), corporate new builds and fitouts, and health projects. Having worked as Principal and Project Director at DTB for 10+ years, Helga was, in 2015, hand picked for her particular skill-set in strategic planning and took a two year break to expand her experience by assisting Sydney Water to consolidate and divest portions of their substantial land holdings. At Sydney Water, Helga was Team Leader of the Strategic Programs Group responsible for the initiation and implementation of major strategies including Risk Mitigation of Trespass on Sites, options for the Workplace Accommodation Program for 2,000+ staff and amenity, feasibility and concept studies for the use/reuse of and development/refurbishment of major Sydney Water sites including prioritizing and development of numerous Heritage buildings. Helga returned to DTB in 2017 with renewed vigour and energy to resume her role as Project Director responsible for day-to-day management of specific projects while assisting with the quality system, human resources, profit reporting, strategic planning and business development. In addition to her extensive experience in the health and aged care sectors, Helga brings a genuine passion for architecture and its place in community. She discusses plans closely with the users, presenting drawings and ideas, listening and then translating the feedback into the built form. Antoinette provides project management services for clients as distinct from architectural services and also assumes the role of internal programming and coordination for larger projects. Antoinette joined DTB in 2011 in the role of Practice Manager to oversee and continue the company’s Quality Management System which has now been certified to ISO 9001:2015 and to develop DTB’s Environmental and Health & Safety systems. She assists in client and consultant coordination on several projects including a major, regional multi-residential development, new seniors wing at a metropolitan high school and single dwelling residential projects. Antoinette has spent the last 20 years in design, property and development management. She has extensive experience in all stages of management for a wide range of projects including commercial office towers in the CBD, large scale, individual and multi-unit residential development within the Sydney metropolitan area, commercial, educational, retail, health, hotel and hospitality facilities. Antoinette trained in Architecture prior to moving across to project management. She has vast experience in the “up front” preparation for construction including client and authority liaison, site investigation, feasibility studies, master planning, programming, coordination and management of the design, documentation & approval phases. Antoinette prides herself on responding to the brief on time. She enjoys the challenges of coordinating the cross flow of information and interaction of the myriad parts of a project which create the entire package. Robert joined DTB in 2017 as senior architectural draftsman after returning to architecture from a break of several years to explore different carer paths, which allowed him to realize that his passion lies in architecture. Robert has a number of qualifications, including an Advance Diploma in Architectural Technology. Prior to that Robert worked continuously as an architectural draftsman and CAD technician for 15 years. He has a reputation as a conscientious worker and meticulous detailer. He has spent the majority of his time so far with DTB detailing and coordinating discrete packages of construction documentation for a new $10M high school seniors wing currently under construction. In addition Robert has documented for construction a new pre school facility, Sydney CBD office roof-top garden, alterations to the Ceramic Workshop at UNSW and several residential projects. Robert is also expanding his knowledge of construction detailing by attending DTB sites currently under construction. James joined DTB as a graduate architect in 2017, he has a Masters and Bachelor certificate in Architecture from the University of New South Wales. He has a practical background in residential construction, working on site through his fathers construction company from an early age. He has also had the opportunity to be a part of a number of residential and small commercial projects, helping with the design and drafting process from concept right through to construction. This includes projects such as an Eco-tourist resort in Bundeena, as well as a residential home in the hinterlands of Byron Shire. James is currently working on concept through DA to tender for several regional and metropolitan private houses; tenancy coordination, heritage and compliance review for a major CBD heritage site; construction documentation for a $10m senior high school extension; concept to tender documentation for various educational refurbishments for UNSW, USYD and has been assisting with 3D site, building mass and solar penetration analysis for a major multi-residential building. Vanessa joined DTB late 2016 in a part-time capacity while completing her studies in the Bachelor of Interior Architecture at UTS and has now graduated. She also has a Diploma in Design in Visual Communications and has previously worked as an Architectural Draftsman on numerous residential projects. Vanessa enjoys the learning process and is employing her skills with commercial projects. While with DTB Vanessa has been working on concept, tender and construction documentation for animal holding facilities for a university, expansion of an existing Council water play facility, kitchen upgrades to an early learning centre, rectification works for a university student accommodation and tender documentation for a new high school seniors wing, rectification for university student accommodation, finishes selection & presentation and 3D modeling for a new high school seniors wing. Vanessa has also been working on the for construction documentation for unit upgrades at an aged care facility and has been assisting with the construction documentation for the University of Sydney upgrades to laboratories and teaching spaces. Caiti has recently rejoined DTB on a part-time basis after a break to travel, exhibit her works and pursue her Masters in Fine Arts and now intends to expand her CAD repertoire and assist with interior design. Caiti is currently assisting with CAD drafting for various alterations, upgrades and additions for the UNSW and providing coordination for finishes selections for the new senior wing of a local high school. Caiti spent some time travelling & exhibiting her art works in Australia, Iceland and Norway. Prior to that Caiti was involved with site measuring, CAD drawing from site measure, drafting & compiling packages for Council approvals and tenders, finishes schedules and selections on a variety of projects large and small and making physical models for small scale projects. Belinda has supported the team in the role of Administration and HR Manager since 2002. Responsibilities include accounts, financial reporting, maintaining confidential staff files and administration support. Prior to joining DTB Belinda spent five years with the Fundraising Department of Royal North Shore Hospital as assistant to the Chairman of Research and the Fundraising Director and editor of the annual research report. Belinda’s early career was with the Commonwealth Bank as an executive assistant supporting several department heads.